Artesia Intermediate School has welcomed a new teacher and coach, recent college graduate Stephen Johnston, to its staff. Johnston earned a Bachelor of Science in Secondary Education from New Mexico State University, Las Cruces, in 2010. 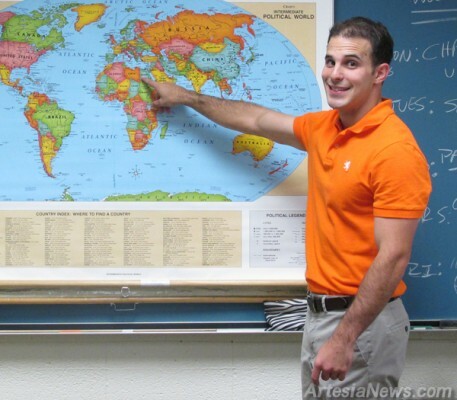 He completed his student teaching during the spring at Artesia High School and obtained the AIS teaching position shortly thereafter. As a sixth-grade social studies teacher, the 23-year-old is passionate about his new career. “The best part about teaching is when students get that ‘aha’ moment,” Johnston said in his classroom on Thursday. “I love seeing them enjoy school and enjoy history. I’m not going to get a kid that likes history every day, but if I can make it fun, enjoyable for them, it means a lot to me.” … For the rest of the story, subscribe in print and on the web.